Trygve Faste is a Sony Scholar award-winner. 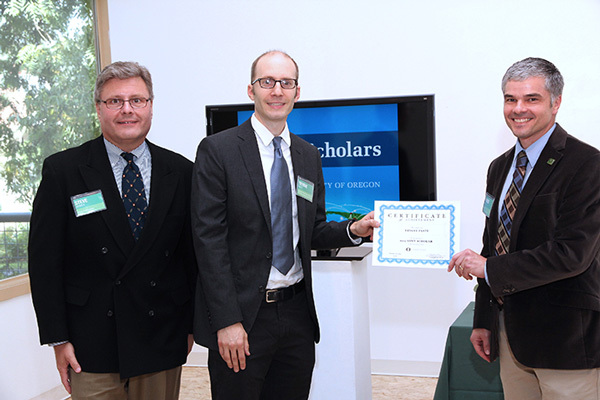 Assistant professor Trygve Faste of the University of Oregon Product Design Program was honored recently with a Sony Scholar award. The annual award recognizes outstanding junior faculty who have shown promise or demonstrated achievement in instruction, research or both. The faculty selection committee also factors in the potential impact of the award on the faculty member's ability to further demonstrate achievement in teaching and/or research. Congratulate Trygve Faste for his award. Award recipients receive a technology package from Sony Corporation and The Duck Store. This year's award package includes a VAIO Touch laptop, a camera, Microsoft Office and accessories needed to work effectively. Through these tools, faculty recipients are much better equipped to engage in outstanding research and instruction. Prior to joining the program in 2010, Faste instructed design drawing, rendering and sketching at California State University, Long Beach. He has more than eight years experience working as a product designer at IDEO, FakeSpace and WET Design. He was the design lead for the water features at MGM’s new CityCenter Project in Las Vegas, Nevada. Along with his design work, Faste is an exhibiting artist who has shown his work internationally, most recently at Nine Gallery at the Korean International Art Fair in Seoul, South Korea, in October. In August, he exhibited two furniture projects (one a collaboration with Product Design Program Director Kiersten Muenchinger) at Salão Design: Casa Brasil, in Bento Gonçalves, Brazil. Earlier this year, Faste received an Opportunity Grant from the Oregon Arts Commission to help support travel to and shipping costs for two solo exhibitions—at the David Richard Gallery in Santa Fe, New Mexico, in July, and at Cheymore Gallery in Tuxedo Park, New York, in August.